It’s nearly 2019 – can you believe it? A new year isn’t just time to get a new calendar. It can also be a reset of your life; a chance to refocus and identify your health goals. 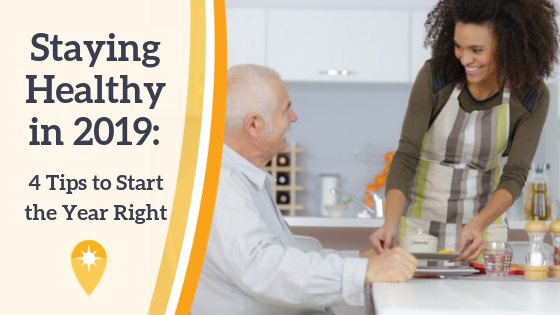 Taking care of yourself – both physically and mentally – is important, especially if you’re a caregiver for a loved one. You’ve got to focus on your own health first before you can help someone else. You might think you’re getting enough sleep, but you’re probably not. The Centers for Disease Control and Prevention recommend sleeping at least 7 hours each night. One in three adults don’t. Not getting sleeping enough leaves you drowsy and unable to focus, making it more difficult to get through the day. While this alone is troublesome, sleep deprivation can lead to more serious health problems over time. It’s important to get your sleep in so you’re fully prepared for the tasks ahead of you. In a busy life, it’s tempting to want to grab a quick snack like chips or fast food when you’re on the run. But eating unprocessed foods, like whole grains, fruits and vegetables are the best fuel for your busy day. That’s because eating lots of vitamins and minerals nourishes the brain, affecting its structure, and how well you feel: good food makes you feel good. If you’re short on time, try buying pre-cut vegetables like baby carrots and meal prep your food for the week in advance so you’ve always got a healthy meal or snack ready. Aside from its more obvious cardiovascular health benefits, exercise has also been shown to improve mental health – keeping you healthier, happier and sharper day-to-day. Just 20 percent of Americans meet the federal government’s guidelines for physical exercise: 150 minutes a week, or 22 minutes a day. If you’re not a marathoner or you’re new to the gym, maybe start by taking a morning walk around the block. Increasing your movement in short increments makes a difference in the long run. It can also help keep you agile and mobile for your day-to-day caregiver tasks. A new year is a chance to re-evaluate if the schedule you’re operating on is working ideally for proper sleep, exercise, and nutrition. If you’re a caregiver, it may feel like you don’t have enough hours in the day. The best caregivers, however, are always rested and healthy. Arise offers a senior day program to get your loved ones the extra care they need – as well as home care services. Visit our website for more information.